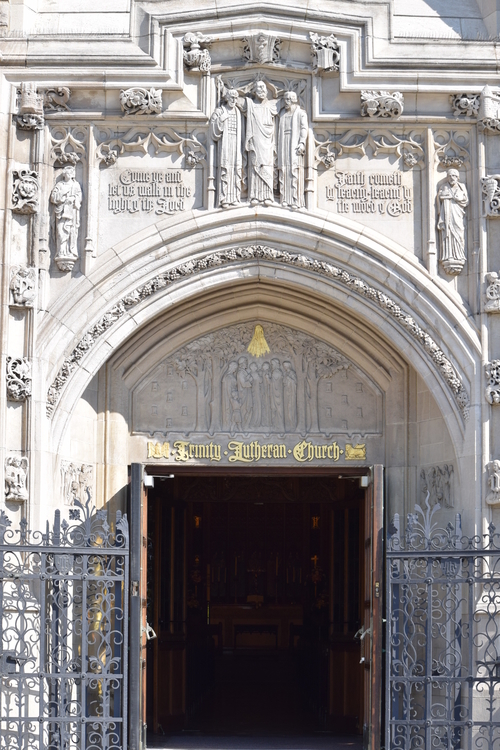 Trinity Lutheran Church of Detroit is designed to express the spirit of that paragraph. A “Church” that is indeed, bringing out in each detail the original meaning of the Greek word Kyriakon: The Lord’s House. Here also art finds its noblest use in the worship of Almighty God, for His plan of salvation for all mankind is depicted in materials such as glass, wood, metal, and stone. This beautiful stone structure is the third church edifice in over a century of history as the Mother Lutheran Congregation of Missouri Synod churches in Detroit. The building is constructed of vari-colored granite and Indiana limestone, with slate roof and floor, oak woodwork and stained glass. Its style is 16th Century Pier-and-Clerestory Gothic, with a triforium gallery similar to those seen in Old World cathedrals.